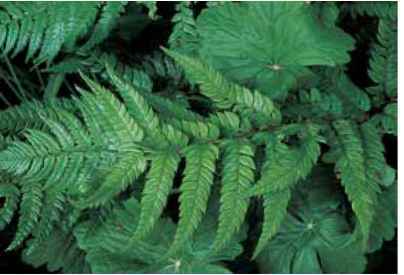 Pentagramma (penta, five, and gramma, line, in reference to the outline of the blade) includes two deciduous species, P. pallida and P. triangularis, recently split from Pityrogramma. The blades sit atop tall stipes, are pentagonal in outline, and have indusia-free sori carried along the veins. Pentagramma triangularis in a typical setting with rocks and woodland duff. Pentagramma pallida (pale) from the piney woods of California's Sierra Nevada foothills has dark, lusterless stipes dusted with white powder. Both surfaces of the blade are likewise decorated giving the upper a (sometimes temporary) distinctive, grayish tinge and the lower a waxy finish. 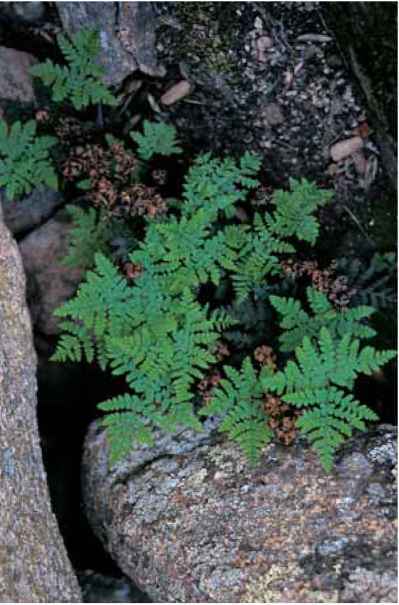 The more common Pentagramma triangularis (triangular), gold back fern, from the west coast of British Columbia down through Baja California, has slightly shiny, coffee-colored stipes. Blades are dark green on the upper surface and usually waxy yellow on the underside although occasionally creamy. Both species, which appear to be so charming and innocent in the wild, are touchy in cultivation. Hardy in Zones 8 and 9, they have a strong preference for acid surroundings, free-draining soil littered with conifer needles or composting leaves, and bright light. As borderline xerics, and like so many of that type, they do not like excessive watering.